Stratum LP | Hawk Research Laboratories, LLC. 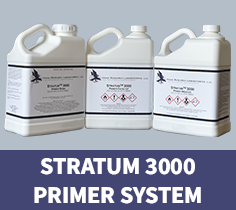 Stratum 3000 primer is a 2 component, low-build amine epoxy primer designed for porcelain, ceramic and glass surfaces. With a very fast cure time and high tack, a short wait time is required before topcoating. Mix 1:1 with Stratum 3000 Catalyst and reduce with Stratum 3000 Reducer prior to spraying. This primer performs very well in wet environments and requires a 30-minute induction time. Pot life is in excess of 8 hours.